Fairy Land‘s Chocolate Skin Pukipuki are now available for ordering. There are a limited number of each doll available, but the dolls are not limited edition dolls. Chocolate Skin Puki will only be available as Full Packages; BlackCat-Tom (boy-style face-up) and BlackCat-Queen (girl style face-up). The outfits and additional parts for all of the dolls are the same. The Chocolate Pukipuki have come in 6 dolls; Pipi, Piki, and Cupid (Tom dolls) and Sugar, Rose, and Lily (Queen dolls). The dolls come with 3 faceplates – standard, sleeping, and winking. Sets of hands included are victory, OK, clenching, and fist/holding microphone hand. The dolls come with the complete black cat outfit, & random wig, Face-ups for the face-plates are optional. Customers who purchase pukipuki between March 20, 2009 ~ April 10, 2009 will receive “Pukisha Set Black Version” as free gift to celebrate the launch of Chocolate Skin dolls. Two new FeePle dolls have been introduced to the Fairyland website, Rona and Iden. The dolls are sold as either a ‘Special’ package or a ‘full’ package. The special package for Rona includes a regular and sleeping head, flat and high-heeled feet, and 18 mm eyes of random color. the special package for Iden includes regular and sleeping head, and random 16 mm eyes. The special package for Rona and Iden includes everything in the basic package along with a wig, outfit, and shoes. Face-up for the sleeping head is extra. In addition, The company is holding a special event with free shoes given along with purchases of their dolls. * Any one pair of shoes ordered together with FeePle during the event period will be sent out for free. * Invoice for order containing Rona Full Package, Iden Full Package and/or FeePle Rona and Iden Set will be sent out with the applied discount. * Only the shoes that are in stock can be ordered together as free gift. * FeePle Girl/Boy Body is not eligible for the event. Fairy Land is releasing new dolls in their Pukipuki, Little Fee, and Mini Fee lines. Pukipuki dolls include 3 new types and 5 new full packages. The dolls are Cupid2, Darjeeling, and Madeleine. The little Fee will also add 3 new types and there will be 2 new full packages. The dolls are named Flora, Shiwoo, and Big Pukisha. The Mini Fee line introduces 2 new types, and 2 full packages. The new dolls are Luke and Rhela. * Eligible price for free gifts include total price of the products only, excluding shipping fees. ** The event applies to all orders placed in during the event period AND/OR payments received within the event period. *** All event faceplates and heads (including Juri 2008 MiniFee head) MAY be released as a regular version in the future. **** Shipping may be delayed more than the stated processing time depending on the amount of orders received during the event period. Thank you for understanding. ***** Makeup and eyes are not supplied with event faceplates and heads. The second pre-order period for LittleFee will start November 21st from 10 am (Korean time) to November 30th, 2008. Shipping for all dolls for the second round of preorder will start in January 2009. The regular sale for LittleFee will start on December 8th. At that time the Basic and full package Little Fee prices will increase. Items that were pre-order gifts will not come with the dolls, but the sleeping face-plate, Big Pukisha faceplate, and white wings can be purchased separately. More information is available on the Fairy Land website . The first round of the pre-order period for Fairy Land’s new Little Fees has started. This round ends November 7th. The dolls will go up in price after the events. There are a limited number of outfits for the full sets so once the outfit runs out, sale of that fullset will be discontinued. There are special pre-order gifts that come with each doll. For more information, go to the Fairy Land website. – Product price will increase once the preorder ends. – Makeup is not included as preorder price. Basic and Full Package products are not limited editions, but there are limited stocks available for the preorder period. Please note that preorder may end prematurely depending on the amount of order received. 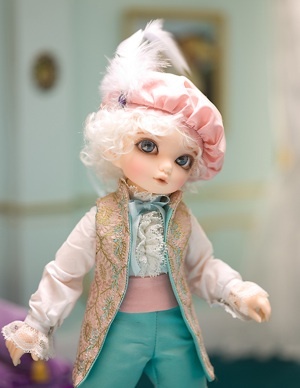 Additional information to add about Fairy Land’s upcoming new doll line Little Fee. Little Fees will come with magnets in the wrists and hands, feet and ankles, and in the heads and back. This will allow easy customization. There are three heads that have been designed, Pipi, Piki, and LittleFee original. They will all be part of the first release. The dolls will be available in both a basic and full package form. 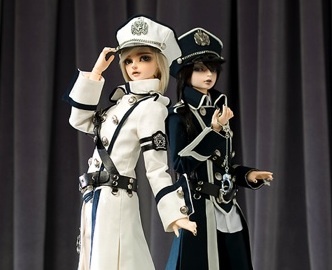 More information on the dolls including price, and more photos will be released once more details have been finalized. Fairlyand has created a flexible small (25 cm.) doll body in a new size that will be used for a new line of Fairyland dolls; Little Fee. No release date for the doll line is set yet. More information will be available in late October or November. The new body is very posable using a new mechanism which Fairy Land submitted for Patent.